#1 to the actual series. You can tell because the DC is blue and white in the upper left. Cyborg is a character I honestly didn't know too much about before recent years. I mean I knew of him, basically what he was and could do, but not as much as I'd like to. I also didn't know what the "boom tube" was, I thought it was just a funny name for the gun(s) he can create at the end of his arm. Nope, it's how he can transport not only himself, but others to locations as far away as other planets. Pretty awesome! 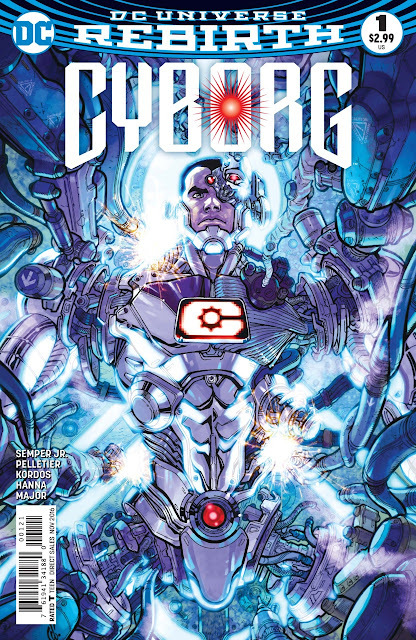 So with the Rebirth onset, I decided to hang back on buying a Batman title and instead subscribed to Cyborg. I was pleasantly surprised how much I've enjoyed this title so far. 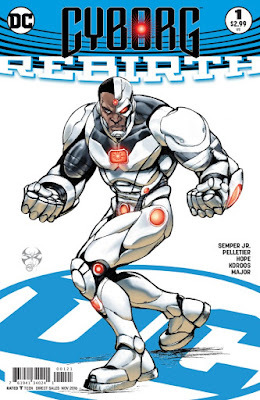 Within the first few issues there are scenes that help establish that Vic Stone (Cyborg) loves Jazz, is twisted between his father having saved him only to perhaps turn him into more machine than man, and how much he struggles with balancing what's left of the human inside of the machine and the duties that he feels obligated to maintain because he now is more capable than his former human-only self. There is also a new villain introduced, more than one, actually. Malware is much like Cyborg in that it can read anything that is going on technologically, as in any thing at all that's on the grid. Information like who you are, any records like a DMV license, arrest record, etc., that tell who you are or what you're doing can be read by these two. 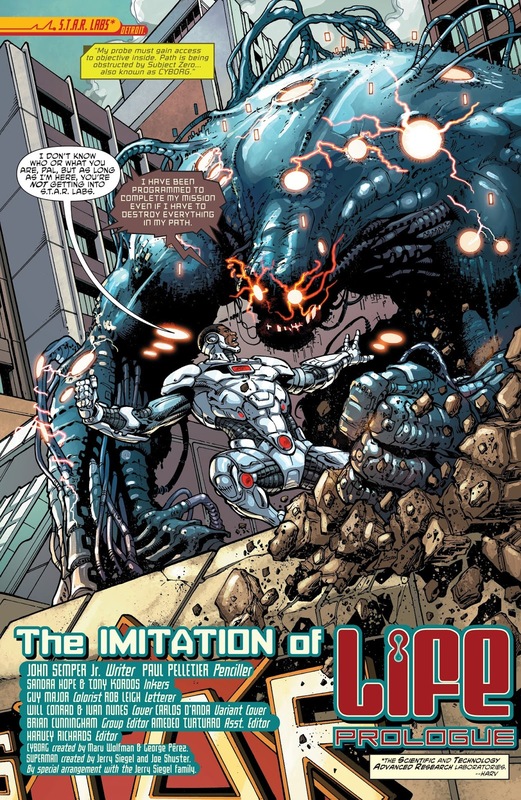 After Cyborg's fight with Malware, it is revealed that the fight didn't end after their throw down, but that Malware indeed lives up to his name and continues his infection. How so? If I tell you that, I'll ruin it for you, right? Well I'm going to tell you anyway, because this is only within the first six issues, so there will be more to read beyond this point and if you can't tell, I'm keeping this sentence going long enough for you to bail out if you don't want to read the spoilers. 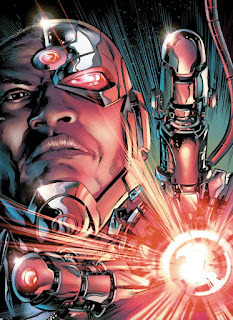 So, Cyborg runs into the entire Justice League, they are stating that he's more machine than man and he needs to be stopped. 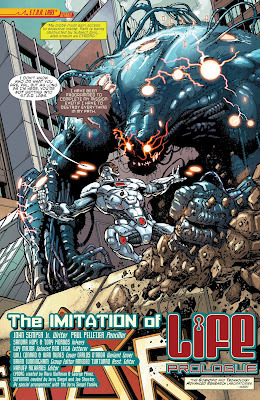 Superman claims that he has no problem with destroying a machine, and of course he's a crazy strong adversary for Victor Stone, so Vic has to think on what he did to gain the hatred of the JL unanimously (beyond an incident where he went a little haywire and briefly destroyed STAR Labs) and comes to realize that he needs to try something different to defeat them. But still, the power of the JL and their ability to survive with him on another planet with no breathing devices, makes it pretty apparent that he's dreaming or being manipulated. This was part of the infection that Malware had left with him, and it's pretty cool to see Malware have that effect still after a few issues. The other villain is ... His dad! Well, not actually, it's some sort of "first creation" created by his father that they won't let on about just yet. But it's apparent that it's trying to torture him, make Vic's dad watch everything he does in order to further his pain and get the revenge that the unnamed machine desires before killing him. So I'm interested to see where this will all go. Then in parts 5 and 6 of the story line "The Imitation of Life," Scarlett Taylor, a former CIA agent that was conducting a mission in Iraq and ends up in an explosion that nearly kills her, is brought to STAR Labs and turned into Variant! 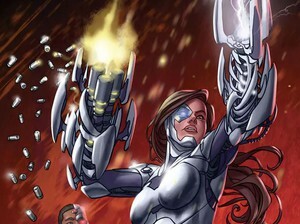 She's got something going on though, because by the end of issue 6, when they return to where her explosion happened in an attempt to regain whatever "important information" it was she lost, she ends up pulling a gun on Cyborg. So that's not cool, but who knows, maybe she has a plan to get the two of them out of there, maybe she's a villain that now has the same abilities as Cyborg. Variant on the cover of issue #6. I'm anxious to read the next several issues that I've piled up over the last several months and find out where all this is heading. But so far, I'm enjoying the main artist on the series, Paul Pelletier. He has a cool way of keeping the details there when needed to accent the situation, and letting them fall back when it's a more simple setting or circumstance. Fits the book pretty well. I actually like some of the battle scenes more because they're a little more gritty, but the Jazz scenes, as well as some of the instances where Vic is walking with Blue are pretty cool and just well done, one of which looks like Pelletier used curvilinear perspective (like a fish-eye lens, typically involving 4 or 5 point perspective), which as an artist myself I can very much appreciate. Cyborg about to get his boom tube on. I'll have to read the next 6 issues and continue my review, see how I feel about it further down the line. I'm not sure how far the "Imitation of Life" story line goes, but it may be the first 12 issues, and I'm cool with that if it is. I want to see how far this imitator of Victor's dad can take this. In case you're wondering, the machine took over that role in the DC Rebirth Cyborg one-shot issue #1 that comes before the regular series #1. He's already working in STAR Labs, helped to convince them to create Variant, so there's a lot of damage he can do in the roll of Vic's father. See you in six issues! #1 one-shot. You can tell because the DC logo is black and white in the upper left. This cover is also drawn by Joe Benitez.